Is your business looking for a compact color device that doesn’t lack on quality? 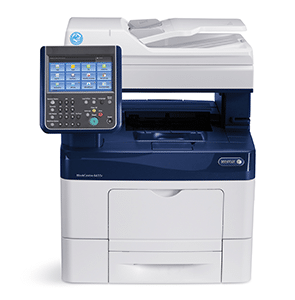 The Xerox Work-centre 6655i Color Copier may just be the copier for you. With a tiny footprint of just 21.2 x 21.8 x 24.6 inches this device can fit right in the corner of any office, saving space for more important things. It boasts an amazing print quality resolution of up to 2400 x 600 dpi and an impressive print out speed of up to 36 pages per minute. And with a monthly duty cycle of up to 100,000 pages per month there is no need to worry about demand. As this device is ConnectKey enabled you have the ability to use mobile printing. No more having to connect to the offices network just to print one document! You also have the ability to download new apps from the Xerox app gallery and print direct from Dropbox, Apple Airprint and Microsoft office 365. The standard model of the Xerox 6655i copier can fit right on a desktop or you can add additional accessories and it becomes a truly multi-functional device. Accessories include additional paper trays, a convenience stapler, cabinet, wireless adapter, etc. The list is endless! Customize exactly the way you want to work best for your business.